WARSAW, Poland (AP) â Several far-right Polish groups have protested outside Facebook's office in Warsaw after the social networking site temporarily blocked their profiles. About 120 people demonstrated in the Polish capital Saturday afternoon, denouncing what they said was "censorship." Those at the rally in Warsaw called on Facebook to respect the freedom of expression as guaranteed in Polish law. 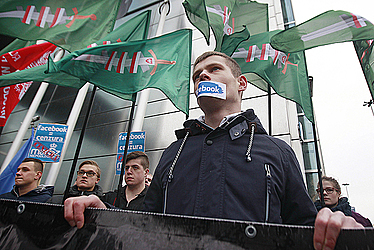 Krzysztof Bosak of the National Movement told the protesters: "What Facebook does is not in line with our constitutional rights." Other groups at the rally included the National Radical Camp and All-Polish Youth.